You made it. You set a crazy cool goal and you reached it! But now the excitement is wearing off and that nagging there-has-to-be-more-than-this feeling is taking its place. Luckily, you have both the answer and the solution to that question. Here are 10 strategies to help you remember what you already know and finally break the cycle of never-enough. 1. STOP. Drop everything you’re doing. Take a TIMEOUT. Whatever you need–a moment, an hour, a day–just be with yourself. Yep, that’s right, do absolutely nothing. As a recovering overachiever, I know how hard that is… but it’s also the first step out of the vortex of never-enough. The best timeouts are usually spent in nature, without your cellphone. Nature reminds us of how effortless growth can be. When we allow that same ease into our lives, any sense of struggle begins to diminish. 2. BREATHE. How are you breathing right now? Can you take some deep belly breaths? If that’s too much, can you simply slow it down? Notice what your breath is like when you’re off and also when you’re on. Deep breathing is the coolest and fastest built-in RESET button. So if you want to get and stay out of this funk, use it. Here’s the simplest way to get started: Inhale through your nose, pretending there’s a balloon in your belly and that you’re filling that balloon with air. When the balloon is full, release your breath on a steady stream through your mouth. Repeat until you feel grounded and centered. 3. LISTEN. Stay with the “not-quite-right” feeling. What’s it telling you? Have you been using work, food, or [insert your fav distraction] to numb that call? We’re not trained to listen, especially to that All-Knowing voice within. Tuning in requires stillness. It means we have to lessen the amount of thoughts we’re having, and the other ways in which we’re ignoring our deeper needs. There are many ways to still your thoughts and quiet the inner saboteur, but even just applying the simple breathing exercise above for three to five minutes daily will lead to heightened intuition and a deeper sense of what you really want. 4. IMAGINE. After deep listening, it’s time to imagine–IMAGE-IN–what you really feel called to right now.Give yourself permission to go back to being a kid, to tap into what you know is already there waiting for you. This doesn’t have to be super complicated. This year, for example, I cut out a 10×11-inch piece of cardboard from an old box, drew 12 boxes to represent the 12 months of the year, and then used different colored paint markers to write down what I felt deeply called to create each month. I dreamed of releasing a book in June, and that actually happened! So don’t underestimate how powerful this simple exercise can be. 5. FOCUS. Follow One Course Until Successful. In a keynote speech about the Third Metric, Arianna Huffington discusses the dangers of multitasking: “You think you’re being efficient, but actually you’re being stupid.” As Arianna points out, we now have scientific evidence proving we cannot multitask. Knowing that, take a look at what you’ve imagined. What’s most important to you right now? Maybe it’s taking time off to spend time with your child or a personal project you’ve been putting off. Whatever it is, it’s time. Don’t let all the things you can choose get in the way of what you know you must. When you set up your time and space to single-task, you’ll accomplish more and feel less stressed and more satisfied. 6. CREATE.To paraphrase motivational author Napoleon Hill’s work, knowledge is not power. It’s potential power. Knowledge without action is completely useless. So what actions could you take today to move in the direction of your F.O.C.U.S.? What could you create? When I had a full-time corporate gig, I dreamed of starting a blog. I didn’t even really know what a blog was at the time. But I used my lunch breaks and late evenings to find out and to simply start writing. What daily action can you take in the direction of your dreams? Small, consistent practices lead to big, crazy, cool results. 7. CONNECT.Who can help you and who can you help with what you’re creating? When you connect to your deepest desires, you’ll also start connecting with the people and circumstances that steadily bring them to life. And remember, in this information age, you can spend time with anyone you want. Find someone who’s succeeding in the areas you feel called to create in and study them. What are they doing differently? Make it a point to learn something from them today—either by reading or listening to their work, or by finding other creative ways to engage indirectly or directly with them. 8. SHARE.Talk about what you’re creating and how you’re connecting. Start to use social media—and all the other ways we can instantly share—to tell your story in as real and raw a way as possible. Pick a platform (preferably only one) to start. I personally really like Instagram, because I feel it’s more storytelling than void-shouting. But you’ll also find me sharing ideas onstage, in a Here to Thrive podcast, or at local coffee shops over java with friends. How do you like to connect? Maybe it’s holding a meet-up, writing a blog post, pitching a piece for publication or hosting a webinar. Whatever it is, remember No. 6 and start creating! 9. CELEBRATE.When’s the last time you celebrated yourself? 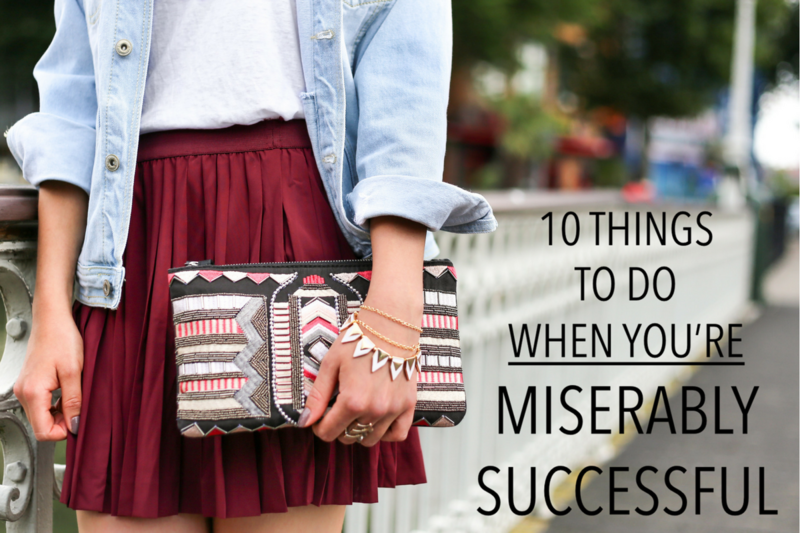 If you’re miserably successful, I’m guessing you rarely (if ever) have. One of my favorite ways to celebrate is to turn the music up and dance! I also love romantic dinners with my husband, special girl dates with my daughter and weekend escapes with friends. What does celebration look like to you? Gift yourself a bath, or a walk in the park, or—if you want to get really fancy—a weekend away! You are so worth it. 10. START AGAIN. Start over. Use these 10 strategies to constantly reconnect with what’s most important to you and to fearlessly walk in the direction of your heart’s dreams. Because here’s the thing: You can’t outsource your growth and the unique contribution you’re here to make. No one else can do this work for you. As Lao Tzu put it, “At the center of your being you have the answer; you know who you are and you know what you want.” Now, go for it! PS: In the comments below, I’d love to know what strategies YOU use when you’re feeling “off”.